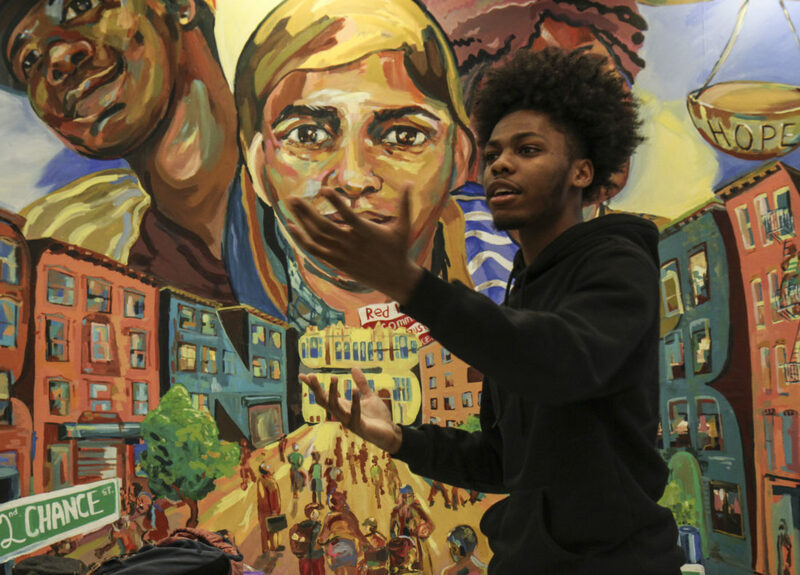 Amare Wells, a teen, acts out a scene during a rehearsal of the Theater of the Oppressed youth troupe at the Red Hook Community Justice Center on March 19, 2019. 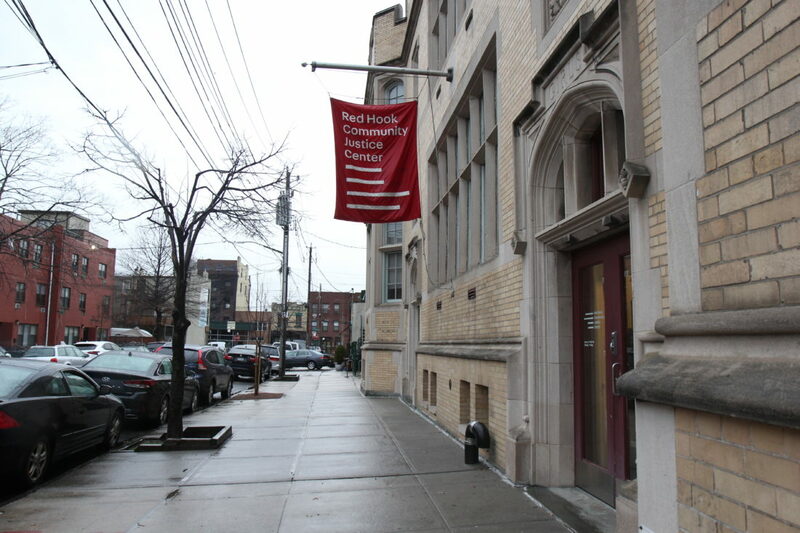 RED HOOK – From the number of people streaming into the Red Hook Community Justice Center last Tuesday afternoon, no one would have guessed that court wasn’t even in session. 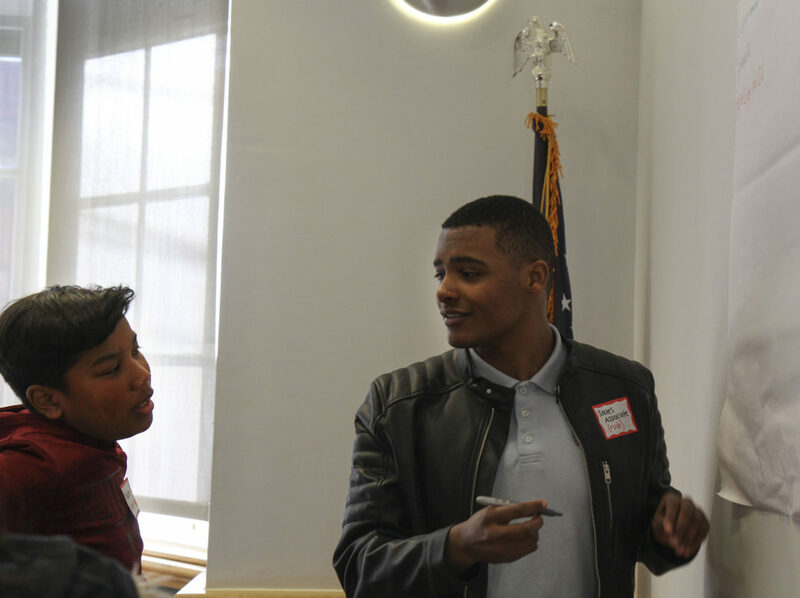 Cyd Honeywell, 14, and Farris Turner III, 17, list characteristics of good citizens during a youth civic engagement workshop at the Red Hook Community Justice Center on March 19, 2019. Each defendant is assessed by social workers to match them to on-site programs, like a support group for people who’ve experienced violence, or referral to outpatient treatments for mental health or substance abuse. All of the center’s services are open to residents on a walk-in basis. Locals may recognize a familiar face at RHCJC, which is the host site for more than two dozen Americorps volunteers. Berman estimates about 80 percent of them are from Red Hook, and many have subsequently been hired into permanent positions. One of those people is Marissa Williams, a Housing Resource Specialist at the RHCJC who did Americorps before being hired full-time two years ago. A resident of the Red Hook Houses herself, Williams said neighbors often stop her in a store or on the street to ask for help. 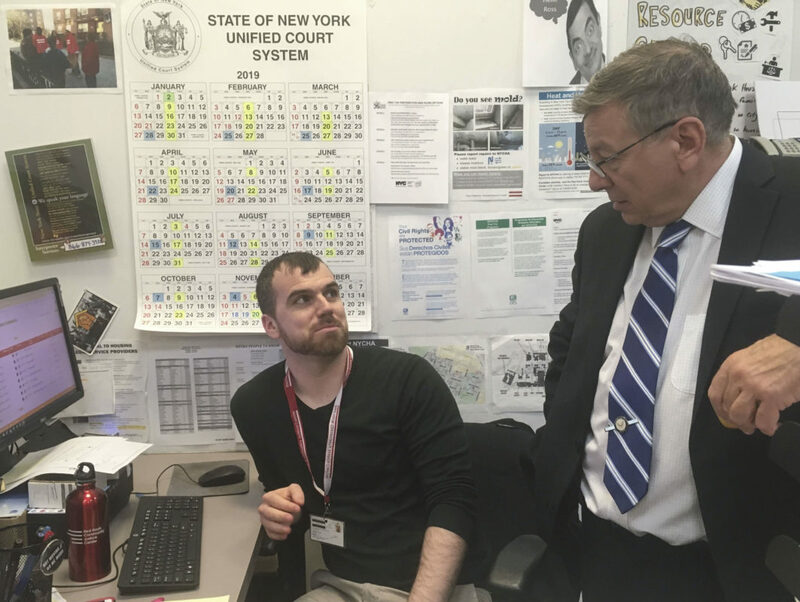 Housing Resource Manager Ross Joy and Judge Alex Calabrese confer while on a conference call with a Red Hook tenant whose repair had not been addressed. Often, that means instructing a tenant to document the problem religiously and initiate a claim against NYCHA. Tenants can be reluctant to make noise about maintenance problems; Williams even had to convince her own grandmother that a recurring leak needed a proper fix. When tenants and agency representatives face off in housing court, Williams keeps a close eye on both parties. She can sense when a breakdown in communication or a perceived slight threatens to derail the process, and she works to soothe tenants by serving as a go-between. The demand for housing assistance has grown quickly in recent years. From 2016 to 2018, both the number of households served annually and the number of housing court cases initiated by tenants nearly doubled. Berman says she is exploring growing the Housing Resource Center staff to keep pace, but needs to ensure any new position can be sustained in the long-term. 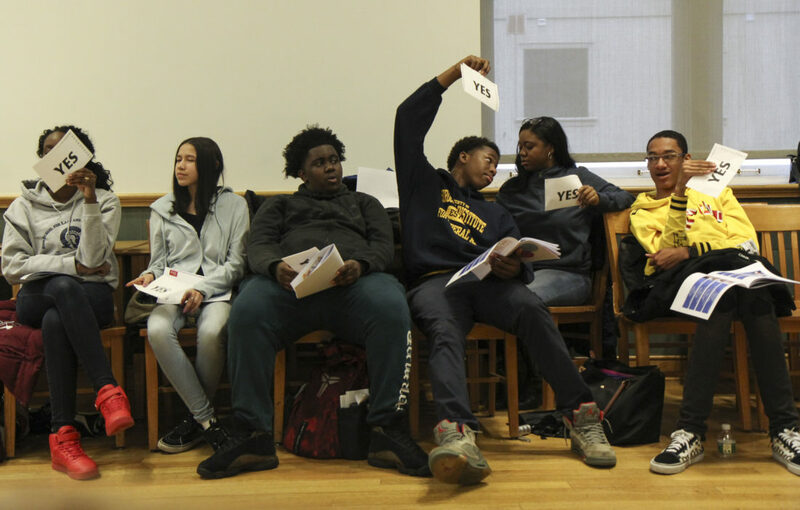 Teens raise signs to show whether they agree or disagree with statements about their power as citizens during a civic engagement workshop at the Red Hook Community Justice Center on March 21, 2018. The workshop was led in conjunction with the American Friends Service Committee, a Quaker social justice organization. Another program in need of additional funding is the Peacemaking program, a community-led restorative justice program based on traditional Navajo teachings. RHCJC staff train residents and police officers to hold circles that engage people in conflict and devise productive steps to repair relationships and build trust. The circles also cast neighborhood officers in a new role. By partnering with another Americorps site, the RHCJC has expanded peacemaking circles to nearby South Brooklyn High School, a transfer campus for students who’ve struggled in other settings. But the other Americorps program will soon end, and the RHCJC is gaming out a way to keep the program alive through a combination of the Spark funds and other grants. 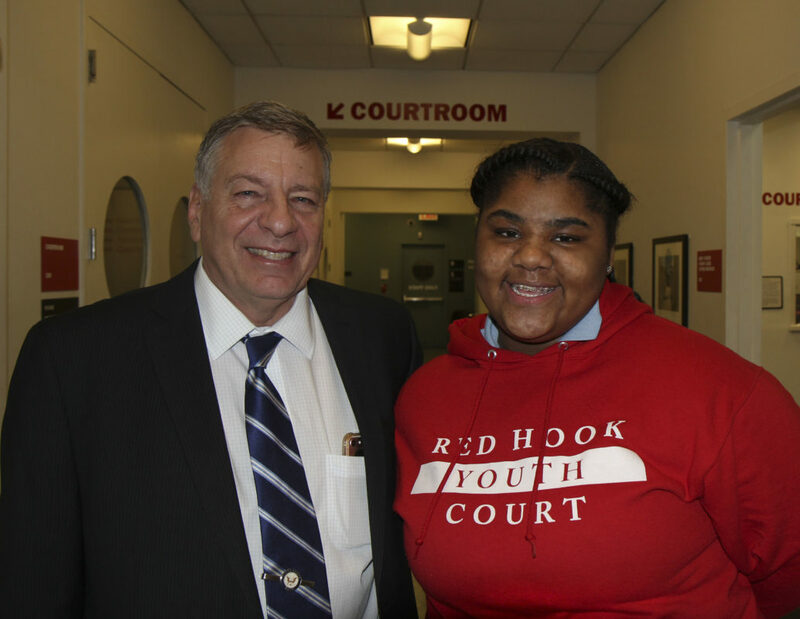 Aniyah Porter, 15, smiles with Judge Alex Calabrese at the Red Hook Community Justice Center on March 21, 2019. Porter is in her second year serving on the Youth Court, which hears misdemeanor cases from area youth, and says serving as the judge is her favorite role. Teens employed by the RHCJC Youth Court program play a similar role as they rotate between serving as the judge, jury, and advocate for minors facing low-level cases. Aniyah Porter, 15, is in her second year in Youth Court and says the experience has already shifted her outlook. Porter isn’t alone in her liking for the RHCJC; a 2016 survey found that more than 4 in 5 residents held positive feelings towards the court. Calabrese says that relationship is by design.